With Halloween just around the corner, why not celebrate by binge-watching some classic horror movies? Universal Pictures Home Entertainment will be releasing 30 iconic films from horror movie history on August 28, 2018. The upcoming Universal Classic Monsters: Complete 30-Film Collection is the first time these titles have come together on Blu-ray! From the era of silent movies through present day, Universal Pictures has been regarded as the home of the monsters. The Universal Classic Monsters: Complete 30-Film Collection showcases all the original films featuring the most iconic monsters in motion picture history including Dracula, Frankenstein, The Mummy, The Invisible Man, The Bride of Frankenstein, The Wolf Man, Phantom of the Opera and Creature from the Black Lagoon. Starring some of the most legendary actors including Bela Lugosi, Boris Karloff, Lon Chaney Jr., Claude Rains and Elsa Lanchester in the roles that they made famous, these films set the standard for a new horror genre and showcase why these landmark movies that defined the horror genre are regarded as some of the most unforgettable ever to be filmed. Another awesome thing about the release is that it includes a 48-page collectible book filled with behind-the-scenes stories and rare production photographs. The collection is accompanied by an array of bonus features including behind-the-scenes documentaries, the 1931 Spanish version of Dracula, Featurettes on Bela Lugosi, Boris Karloff, Lon Chaney Jr., and Jack Pierce, 13 expert feature commentaries, archival footage, production photographs, theatrical trailers and more. The Creature Walks Among Us (1956). What’s your favorite classic horror film? 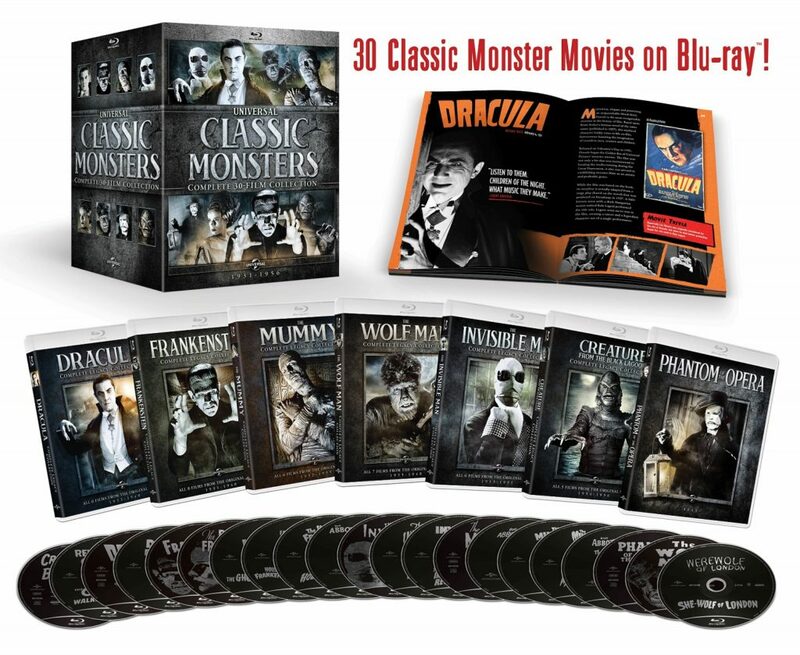 Are you excited about the Universal Classic Monsters: Complete 30-Film Collection? Let us know.